The boot/trail runner controversy will likely go on forever, but I’m confident everyone can agree on is this: it is even more important to take care of what you wrap that footwear around: your feet. Here are ten best practices to keep you blister – and injury – free for your entire thru-hike of the John Muir Trail. 1. Reduce the pressure and wear on the soles of the feet. You do that three ways (in order of importance): reduce your body weight, reduce your pack weight, and use trekking poles. 2. Keep water from streams, puddles, snow, rain and dew off your feet. I know the trail-runner crowd will disagree, but waterproof boots and short gaiters combined with taking your boots and socks off when you cross deep water (and then thoroughly drying your feet afterward) have worked for me, without fail. Carry a pair of waterproof pants to don when it starts raining. 3. Wick sweat away from your feet. A fresh pair of high quality socks (no cotton) each day will help keep your feet dry. I carry two pair so that I can slip a relatively clean set on each morning, after laundering them and drying them on the top of my backpack. Some folks have great success with wearing two pairs: a thin inner sock and a thick outer one. Foot powder can help keep your feet dry, too. 4. Soak your feet for ten minutes each night in cold water. Fortunately, cold water is seldom difficult to find! 5. Once you’re done for the day, and at lunch, either wear camp shoes or significantly loosen your footwear so that your feet can swell. 6. When you take a break get off your feet. Even better, raise them higher than your rear end for a few minutes. 7. Before rising in the morning, do these two stretches: straighten your legs and bring your toes up (towards your knees) as far as possible and hold. After three sets of these, do the same stretch with your knees bent. This will stretch your Achilles tendon and plantar fascia before you take your first step of the day. 8. Be careful where you step, particularly going downhill. Ankle sprains occur more often when we walk faster – like when we descend. Once again, trekking poles really help. 9. Re-adjust your footwear before you continue on after reaching the top of a pass. For me, that often means tightening the toe box a bit. 10. Factor in the surface when calculating your miles for the day. Long stretches of soft dirt is where you want to step it out. Occasionally, you’ll encounter what appears to be trenches filled with fist-sized rocks; slow down and live to hike another day. Take care of your feet and they’ll take care of you! Hallo Ray, reducing weight is the main thing to take care of your feet. So I agree to your opinion. I wear shoes made of leather, because they’re “natural” and when its wet they adapt at the form of your feet and oxygen/sweat transfer will be managed better then in shoes made of Gore Tex and mesh. Leather is a real “massage” for your feet. (You don’t need any moisture, which saves weight, too). It’s a little bit more weight but it’s worth to wear. High shoes are not necessary at hiking. It’s not rock climbing. Tie the shoes loose and there will be no pressure at your feet. If in doubt you can wear a plastic bag directly over your naked feet while creek crossing or when its wet, but no longer. And even in the desert take a little amount of water for your feet to wash the sand away and clean them for the night. Everybody has his shoes. I wear Scarpa mojito(whole soft leather) or sometimes Hanwag Tingri (which are very soft, but they are high shoes and probably better in snow). When there is pressure on your feet use tape or even there are blister take tape or simply adhesive tape to press the blister down (e. g. in Germany Leukosilk) which is cheap and light weight. I know it’s a never ending story, but I only had few insignificant blisters. I admit I never got wet feet at the JMT and I don’t hike longe trails to often. Thanks for the comment, Johannes! Aloha Ray, I’m definitely a believer in hiking boots. As you know, last year I wore trail shoes, I’m a hiker in Hawaii where the terrain tends to be more muddy and heavy red dirt. The mesh tops let in too much dust and dirt on the JMT, my toes were grinding in grit for 6 days. Thank goodness for soaking my feet in the stream at night and lots of mole skin. This year I have new boots, yea! And taking my trekking poles. My goal is still lots of photos with my buddies and no blister pics! Hope to see you and your beloved along the trail. Happy hiking! That’s a great point, Diane. I, too, prefer to keep my feet clean. In dusty terrain some short, light gaiters are a great addition. Thanks for the comment! Hello Ray – I love my boots — so I will stick with them. Taping hot spots prevented blisters and soaking feet in cold water mid-day was always wonderful – it was like getting new feet for the rest of the day. I carried wet wipes to clean up with when camping away from water or when it was too cold –so I always cleaned my feet – no grit means happy feet. Since I went late in the season, it was sometimes too cool to dry socks in 1 day, so I recommend taking 3 pairs of socks. Then you almost always have a dry pair. I enjoy your advice and stories. Can’t agree more with every point, Linda. Thanks! I bought two pairs of boots back in 2010: a pair of Scarpas and a pair of Asolos, both regarded as top of the line heavyweight hiking boots. I intended to try them out in my living room and then return the pair I didn’t like. But I ended up keeping them both, because they were both good, but each in its own way. The Asolos, model Powermatic 200, required no breaking in. Their leather was 2.9 mm thick. They were comfortable from the first time I put them on. The sole was flexible, as was the rest of the shoe. It twisted and flexed any way my foot did. They had a Gore-Tex lining, so were waterproof and breathable. The Scarpa SL M3 literature recommended a 100 mile break in period. It ended up being more like 150. The soles were rigid owing to a steel shank that went through them. They had no Gore-Tex lining, but the 3 mm leather was said to be breathable. 3 mm is as good as waterproof, because you’d have to immerse them in water for hours before it got through to your feet. So why did I keep both? Because each had fundamentally different design goals, and each had its place. The Asolos, being more flexible, were ideal for shorter hikes involving scrambling up or over granite. The third time I hiked up Half Dome in Yosemite, a 15 hour, 4800 foot climb from the valley floor, I used my Asolos and loved them for getting up the mostly solid granite. Backpacking in the Sierras, however, introduces different issues. First of all, you’re carrying a lot of weight in a backpack – for days or weeks – vs a light day pack or fanny pack for Half Dome. Second, the trails are different. Below the timberline – under 10,000 to 11,000 feet – the trails are mostly benign, soft compacted dirt that’s easy on the feet. Above that and you’re walking on granite, but instead of the solid granite of Half Dome, it’s covered in loose pieces of granite in all sizes down to golf ball size and smaller. When you step on three small but different sized rocks, the sole of the Asolo shoe will flex and twist as it finds contact with each rock; the sole of your foot will similarly flex and twist as it follows the shoe’s sole. 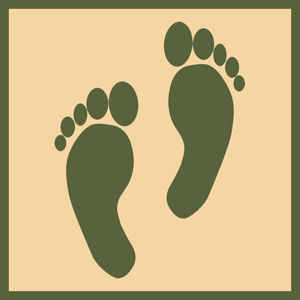 This is fine in small doses; however, when it takes place repeatedly over a long period – days, say – and when the hiker is carrying a heavy pack, the soles of the feet feel like they’ve been turned to hamburger. The sole of the Scarpa, on the other hand, is rigid, forcing the plane of the sole to find all three points; in this case, the foot accommodates the 3-D rotation of the sole’s plane via the ankle, a fundamentally different motion. The soles of the feet are unaffected. Small accommodations are not a problem, but steep tilts can twist or sprain the ankle. The leather collar of the shoe protects against this to a degree, but (probably mild) ankle injury is a possibility. The rubber soles on the Asolos are softer and wear down faster. Those on the Scarpas are harder, more durable and have taller lugs to begin with. They last much longer. Because of these differences, I reserve my Asolos for day hikes, and my Scarpas for High Sierra backpacking. Though I returned from my JMT hike with a slightly tender ankle, I’m even more sure now that the Scarpas were the right choice. Not least because when I set out from Happy Isles in Yosemite Valley, they had 177 miles on them and were as comfortable as bedroom slippers. After the JMT they now have over 400. They may need resoling at 800 or so. I remember seeing a picture on the web of someone’s Scarpas being retired at 2000 miles. Now THOSE are BOOTS! Thanks, Joe, for this terrific rundown. I have owned some Asolos and I agree with you: they are amazingly comfortable the very first moment you put them on, and they are also among the least durable footwear I have owned. In a way, that makes sense: soft, pliable stuff tends to wear more quickly. I have not owned a set of Scarpas, but you make me want to! Thanks again!